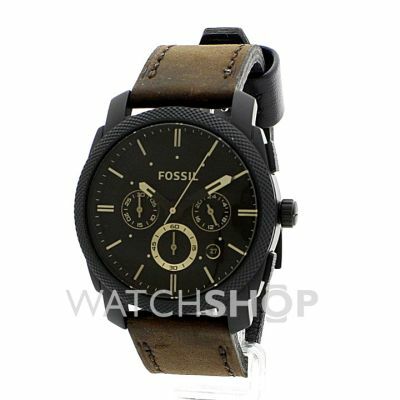 This Mens Fossil Machine watch design has a black ion-plated case with a round face and dark brown dial. Features include chronograph, date function and gold baton hour markers. The watch fastens with a dark brown genuine leather strap and is powered by a quality quartz movement. I’ve had this watch for almost a year now. I believe that this product has an excellent value for money and exceeds all the expectations of a reasonably priced watch. I use it almost every day and so far the crystal has only a few little scratches. Most people seem to appreciate the look of it and often compliment my choice as elegant and distinctive. 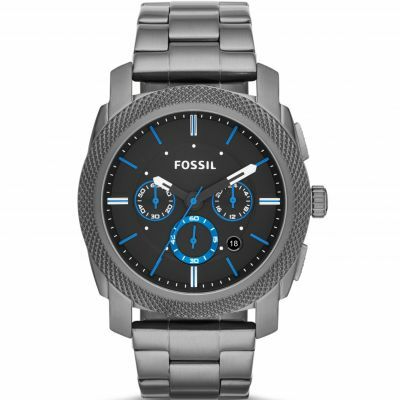 This Fossil is better than good and I can’t honestly think of any noticeable flaws. The watch strap may feel a bit rigid in the beginning because of the kind of leather but once it’s been worn for a few days it will be perfect. Its simply an Amazing watch. Feel free to comment if you have any questions. The watch is of solid build and has a a great masculine look to it. The item is excellent and it was arrived the next day when I ordered it, thank you. I was very pleased with the quality and look of my watch. I wanted something that looks good for everyday wear and this fits the bill. It has a wide comfortable strap and a clear watch face. It comes with a 2 year guarantee and I think it was good value for the money I paid. This watch is awesome! The most beautiful Watch I have! My son was delighted with his Christmas present. Excellent quality product. Free delivery was a bonus and arrived on time. Would recommend. Fantastic service! Very happy with this purchase,would buy again. Super watch for a great price. I was looking for a smart everyday watch for my husband, and this watch was perfect. Service was great - delivered in time for Christmas. Fantastic! Just what I was looking for. I bought it as a Christmas present for my partner and it had everything I knew he was after-leather strap, clear face, date function, everything. I just received the watch and its great! Brand new..without any scratches or something else. It looks so good and you can wear it at any event. I can say that I am satisfied! A beautiful watch. Stylish,sporty but simple and unpretentious at the same time. Very good value for money. Arrived safely and well packed. Watch is a Christmas present and looks exactly as it does in the picture so hopefully he will like it! Ordering was very easy and delivery was quick - I liked the email updates on this.\r\n\r\nOnly one criticism, the box it arrived in is a bit girly - its pink. I know you can choose these boxes when you buy directly from Fossil so maybe allow an option for this or just tailor to men/women a bit more. Bought as a Christmas present for my husband. I hope it will be well received. Quality watch, really good build quality and excellent service, arrived next day in perfect condition, thanks! Nice watch. Colouring is the same as the picture. Good buy! Very nice watch but marks very easy that is the only issue Ive had with it so far ! Lovely watch. Excellent service, so easy to order and received the next morning free of charge. I bought it as a gift for my husband as he wanted a larger watch. 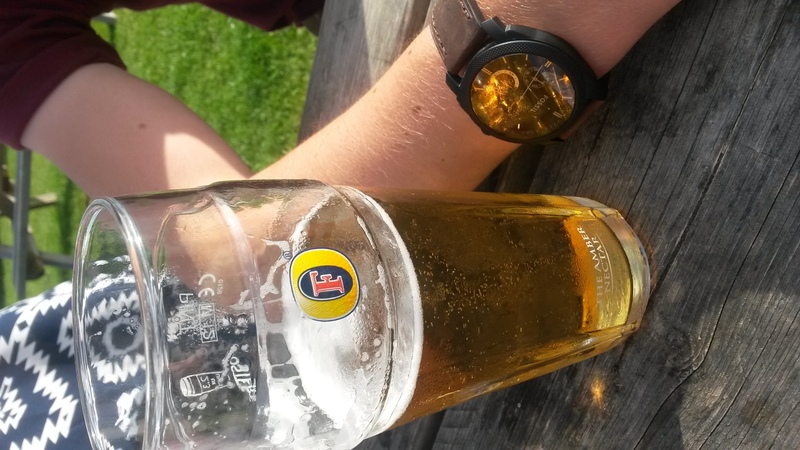 He absolutely loved it and the colours go together very well making a nice casual watch for any occasion. I ordered this watch for my husband for his christmas, he has not yet seen it but im sure he will love it. The watch is very modern and different exactly what i was looking for when i purchased it.It was a very good price too, i look forward to seeing my husband open this in christmas day. Great service. 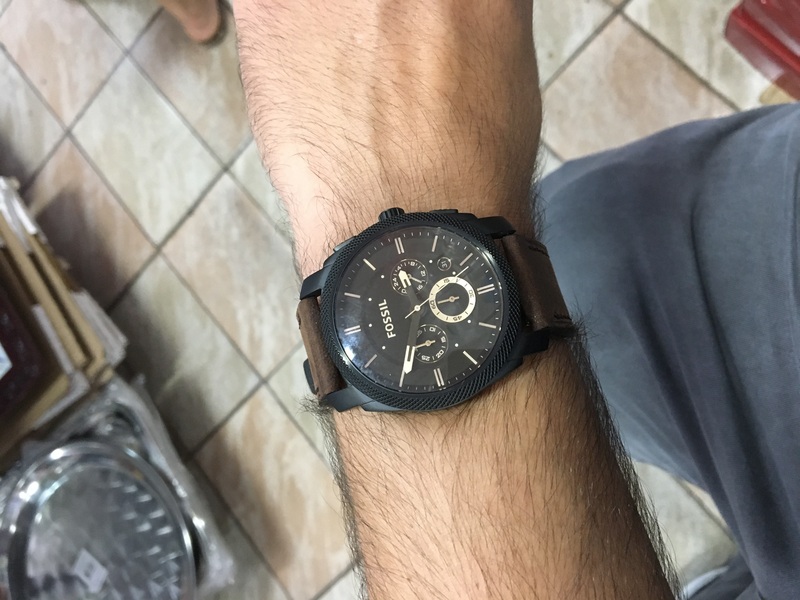 Was going to buy the watch in one of the department stores and found it in Watchdhop much cheaper and with the quick free delivery it was perfect. Will definitely shop again on Watchshop. Bought as a birthday gift and recipient really liked it. Superb Fossil watch. Perfect size for my small wrists and comfortable to wear. Love the brown dial and brown strap. Very good price and would highly recommend. Excellent websit. Good selection of product. Very fast second day delivery. Excellent value for money. Good looking watch. Very happy with purchase and delivery. Had been looking for a watch a little different from the norm. Also was wanting something not too big and bulky as most watches now seem to be. This watch blends a matt black frame with a dark brown face and strap surprisingly well. It sits quite flat to the arm and does not have a huge face. The strap is quite thick which gives it an impression of good strength. I ordered this on a Sunday evening online and received it early Tuesday morning. All in all I am very impressed with the service from the website and even more impressed with the product. The watch looks great, the size is right. Great for a present. What a lovely watch. Bought this as a birthday present for my dad he loved it. Likes that it came in a lovely presentation him. The watch looked just like the image on the website. Solid build, and good earthy colours. The watchface itself is a tad smaller than expected, and feels small on the wrist, but then i do usually wear either a Big Daddy 2.0 or Storm Navigator 2, so thats expected. Would still recommend though! I like this watch so much...i like the stitching on the leather strap. 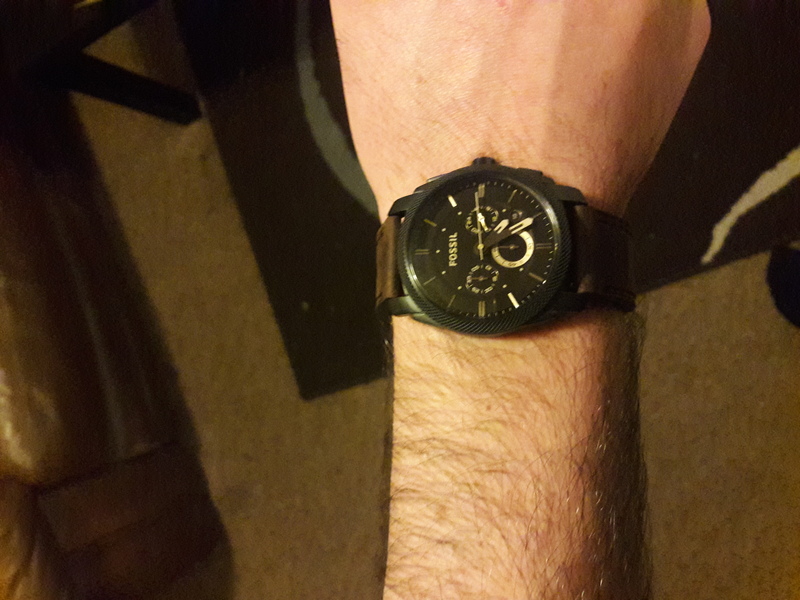 A really nice looking watch, got it for my boyfriend birthday, he really liked it as well. But the only thing was I didnt like the packaging it came with, the box looks a bit cheap, but overall Im happy. I absolutely love my purchase. In the past month I have bought atleast 3 watches from watchshop. However this one was my 2nd fossil watch. I read the previous reviews before making my selection and watched the video clip. There nothing that I dont like about it other than it looks far much better in real life. 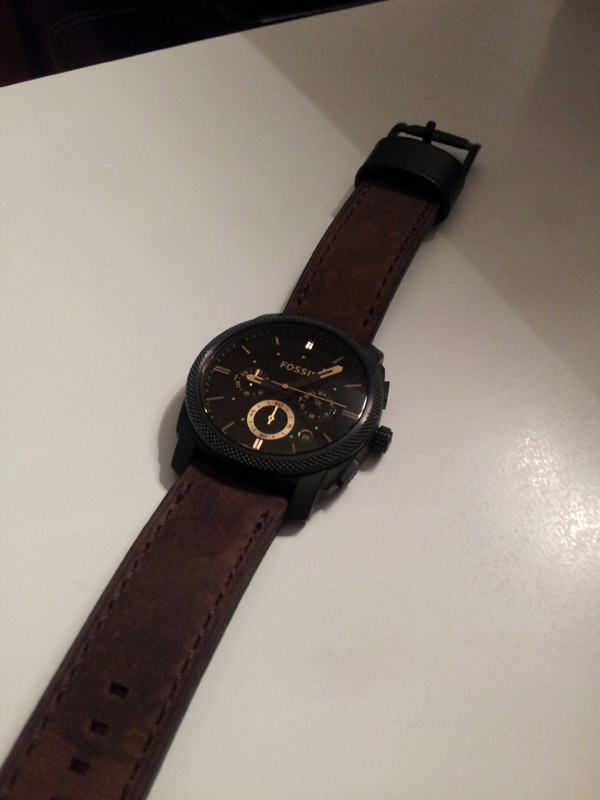 Its a very nice dark brown stylish watch with a strong watch strap. Excellent watch, the strap is a lot thicker than its look in the photo which is a good feature if you plan on wearing the watch everyday! Havent tested the water resistance yet. All in All an excellent watch, and cant go wrong with the price, a lot cheaper than on the high street! The watch is beautiful and my boyfriend loved it! 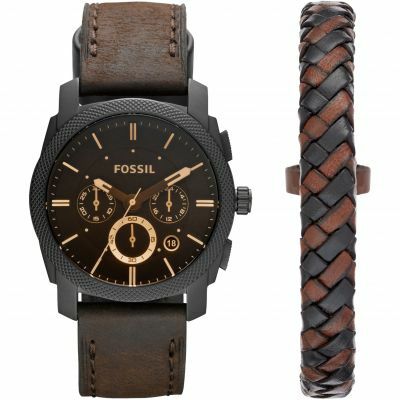 The leather strap is a lovely shade of brown and face with all the features is amazing! This watch is smart and fashionable for age young ages as well as slightly older gentlemen. The leather strap is sturdy and strong.The booklet which comes with the watch is simple/easy to follow. 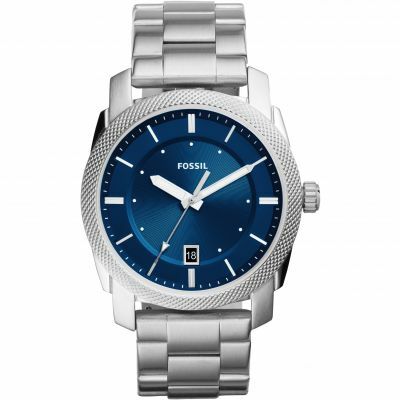 I have bought Fossil Watch for my boyfriend as a Christmas gift. Watch look very nice, leather is very thick. Watch is lovely and I believe my bf will love it. Excellent watch, sophisticated style, leather strap. Everyone asks where I bought it and wants to try it on. I bought this watch for my boyfriend for his birthday. He absolutely loves it and it really suits him! They leather has a lovely texture and is unlike others he tried which were hard and didnt shape to his wrist easily. I wasnt 100% sure about the brown face when I first bought it but it looks really nice and does well with the black. He wears the watch in the shower and it is still fully functional and he finds that it doesnt absorb water at all so dries quickly. They face of the watch is fairly small which suits him perfectly as he has slim wrists and some other similar diesel watches he tried had a very big face ! fabulous looking watch and superb quality feel about it. colour choice was huge and the brown watch and strap is superb, the chunky look and size all add up to a watch with a bit more class and distinction. Excellent watch and excellent service. Received next day in perfect condition as described. Received this watch today and am absolutely thrilled with the quality, look and feel of this time piece. The face is darker than it looks in the pictures, however it compliments the chunky real leather strap in all lighting. As someone who normally goes for a metal linked watch, the quality and smell of the rich brown leather strap in particular is a great bonus. Would recommend to all. Son very pleased with his watch - 25th birthday present. Excellent service from watch shop. Delivery quick. Fantastic product, great looking watch - fantastic service - 10 out of 10! Will recommend supplier to others. looked even nicerin real life.Very stylish and well worth the money.Just hope my husband likes it it is for his Christmas! Looked better online than when it arrived. I was kind of disappointed when i saw it. I even contemplated on returning it because it lacked the wow effect that i has seen before however my friend really liked it so i decided against it. 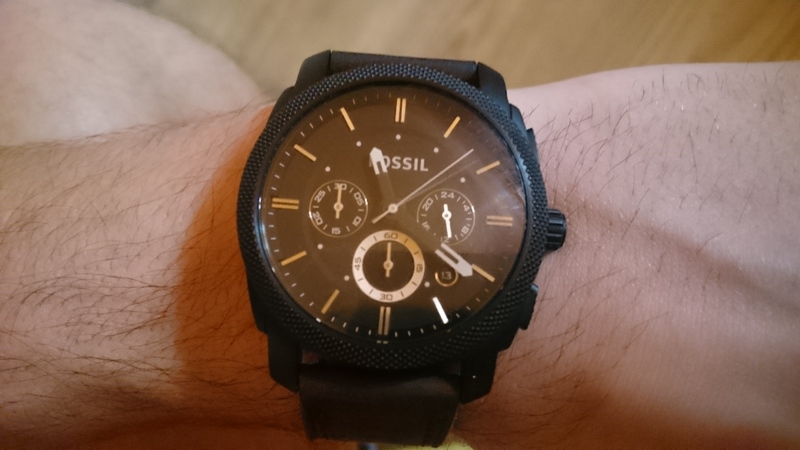 In short, I think this Fossil watch just looks and feels simply fantastic! Literally everything about it is just perfect in every way and I can say without hesitation that this watch is flawless. It has an extremely comfortable leather strap which looks particularly expensive and just feels incredible on my wrist. The colour choice on this watch is also the reason it had attracted me on the website but now that it is in front of my eyes it looks even better and is without doubt the best Ive seen. Everything is great about this watch but what I fancy the most is the unbeatable overall style and look of it... It automatically looks expensive on the wrist even though it is probably the cheapest watch out there of the same style. So in conclusion, this watch looks great, feels great and is great keeping in mind the extremely low price! I realy like this watch ... Its the best watch i bought ! And also thanks for the super fast delivery ! Great watch, stunning face and looks even better on. The strap is a bit stiff but softens after about a week. Love this watch. I initially thought it may be too big for my skinny wrist (6.5inch at the wirst bone), but it fits perfectly. The watch is well designed and well built and the real leather straps complement the design. It is a rather discretely styled watch, nothing fancy just simple and elegant. My only criticism is that the instructions on how the chronograph works are not very clear, which meant that I spent some time trying to get my head around setting it up. Google helped. The watch really looks great. Its made of very solid material and is a pleasure to wear! Item arrived in perfect condition, in less than 3days from date of purchase. (UK to DK) Quick &,professional ,truly recommend it. what a great looking watch. I absolutely love it. It feels and looks great on the wrist and the quality of the watch and leather strap is very good. I would not hesitate to recommend this watch. Very nice, stylish watch indeed. I haven't worn a watch for years so this feels a little big on my wrist but I'm sure I'l get used to it. The only small niggle (which I should have considered) is that it doesn't have a light making it virtually impossible to see when dark beacause of the dark face. That said in all other aspects this is a very nice watch. Great product and amazing customer service and delivery. 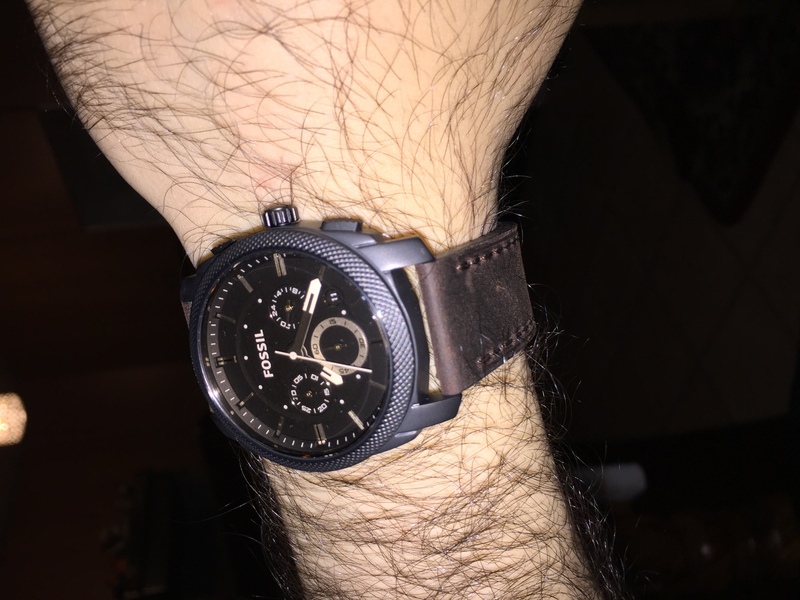 I really like the fossil chronograph watch I bought. Its looks beautiful and elegant meaning can be used for multi-occasions, also it's colour is calm and matured with the brown lather strap suits wide range of age. My husband and I are so pleased with the quality and look of this watch. The brown strap has a weathered feel to it, the black and gold dial is suitably chunky for a men's watch. Nothing to dislike about this watch at all! This watch is lovely....I have bought it for my husband for Christmas. Really good quality. It is of great quality, the leather is worth the price. The rythm in the colour from the leather to the face accentuates the a powerful sense of maturity. the gold-like touch in the face sends all the message. It's not the most expensive but it displays quality and its simply unique. The most important thing in shopping is to buy what would fit you and for a wristwatch as these am sure it will project the colour of the skin and catch attention to itself.The packaging and delivery service as well, all came intact. Just keep up the good work, because I didnt have to repack to give it as a gift, I just sent it straight away.